Well this is a very long title but I can assure you that what I’m going to show you si simple & unique – A Jord Watch! The holidays are knocking at out door: Thanksgiving, Christmas & New Years Eve & we’re in rush to find the perfect gift. Everytime you strive for the perfect & unique gift that creates a memorable moment, but it’s kinda hard to find. Most of the gift sets that you’re going to find in store are simple gifts that you’re going to use and throw away. As a woman, I really love original & unique gifts, those gifts that put a smile on your face when you remember that special moment you received it! 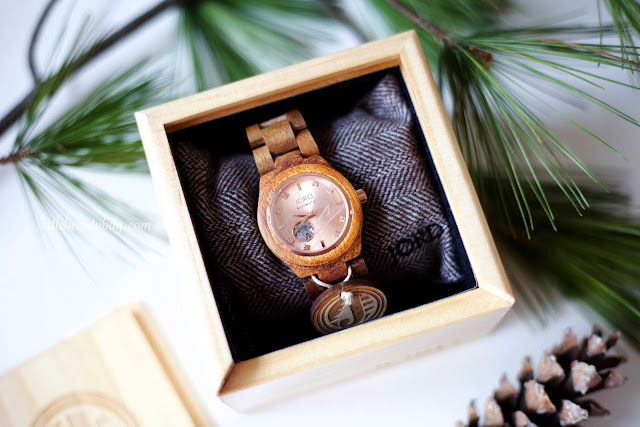 Artists, designers, creative people are behind this amazing & unique watches & when they all work together they create wood watches..yeah, you heard me right: wood watches! I had the wonderful opportunity to collab. with them & they were more than nice to send me 2 ahhh-mazing watches: 1 for ladies & 1 for gentelmen! Today, I’m going to talk about the 1 – for ladies! 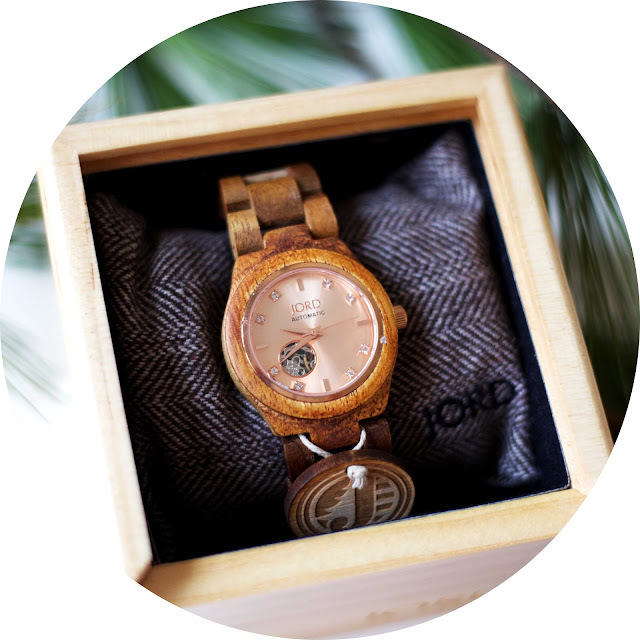 The Koa & Rose Gold watch is part of the Cora Series & Cora Series has 5 wood watches ( including the one that I’m going to talk about today ). 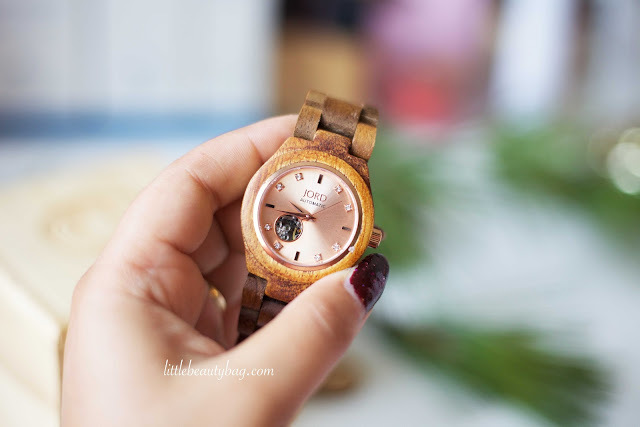 What I love about this watch is the rich rose tone that makes you desire it so much! I think this is the first thing that attracted me to this watch. It’s simple but complex, it feels & looks luxurious. 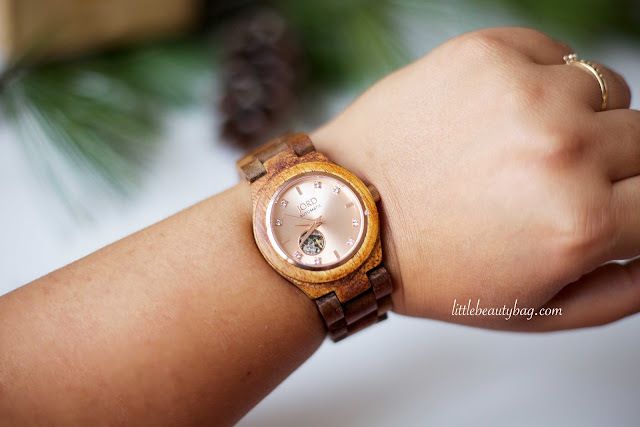 Is made from koa wood which is a large tree that grows in Hawaii, so practically you’re wearing on your wrist a piece of Hawaii – love this idea! The watch arrived in a light wooden box with a lid that slides. Inside the box I found the amazing watch, resting on a little pillow. I also found a warranty card, a cleaning cloth, 2 more cards & extra links. 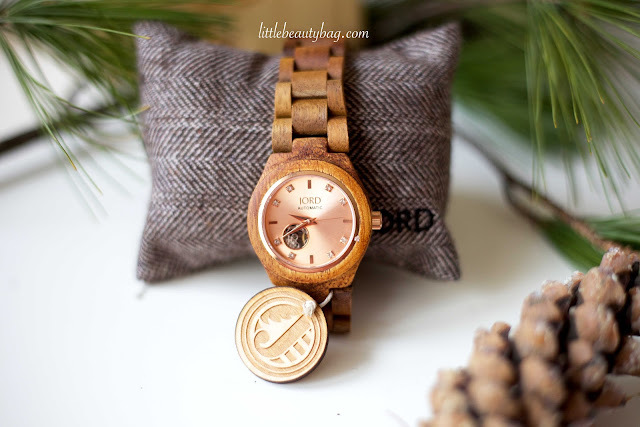 The watch had attached a wooden medalion with Jord logo. The way the koa wood combines with the rose gold tones blows your mind. The watch doesn’t require batteries which is so awesome but needs to be hand wound. I simply love the swarovski markers & the see thru glass that lets you see the movement inside the watch. 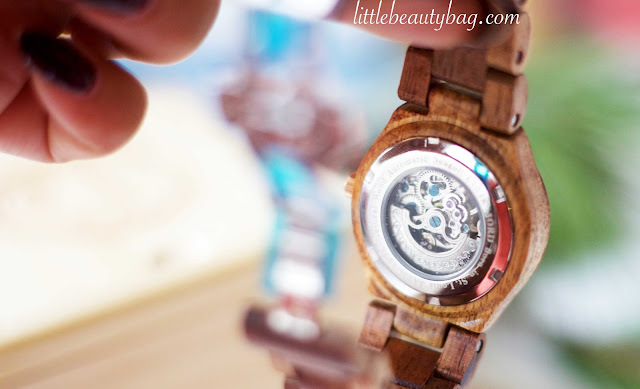 It’s such a feminine & lightweight watch! The Cora watch is spalsh-proof but NOT underwater proof so please take care, also avoind to store it in a dry/humid place. Lemon or orange oil extracts are the best for cleaning this watch and give him that natural look. Overall the Jord Watch is such an amazing watch that suites my taste, that is unique, is light & looks luxurious! I really recommend it ( don’t forget that the holidays are coming quick ). 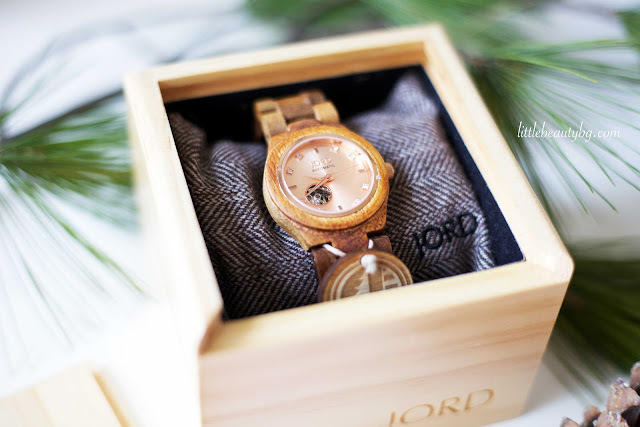 The Jord Watch retails for $275 but worths every penny, so if you’re looking for an amazing gift or a unique, unusual watch then check their website cuz they have a large selection of watches for you to choose from! I really hope you enjoyed this post, if so, let me know in a comment below! 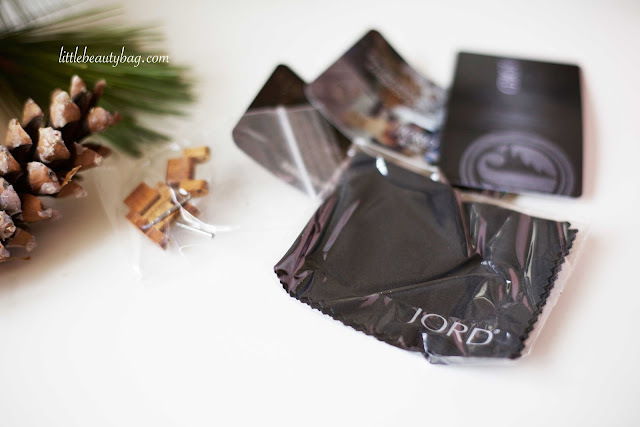 Are you considering buying a JORD watch or not?